Brake fluid is essential to have in any braking system, such as a disc or drum braking system. Without brake fluid, the components of the braking system would not be able to function properly. Then your vehicle would not be able to slow down after you step on the brake pedal. Your brake fluid needs to be able to resist heat, given the driving conditions it is put under. Otherwise, it will be more difficult to brake your vehicle at the appropriate times. Brake fluid serves as more than just a lubricant for the braking systems’ components. It is a hydraulic fluid which transfers force pressure into hydraulic pressure. 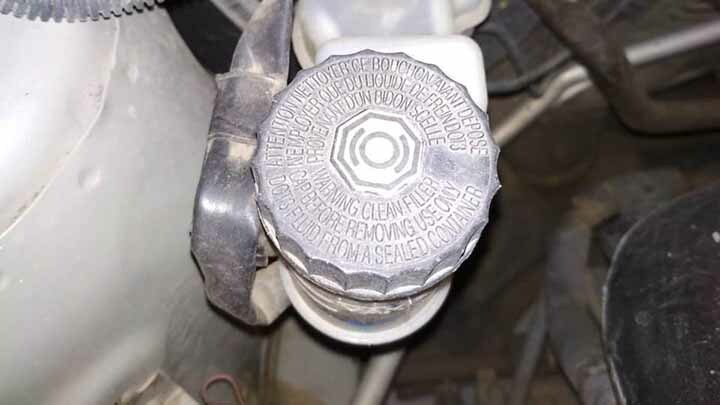 In other words, when you apply your foot pressure to the brake pedal, there is a reaction where the brake fluid flows to the brake circuits and produces hydraulic pressure. The hydraulic pressure will then cause the brake shoe or pad to rub against the disc or drum. To understand the technical side of this, let’s examine it further. The force of your foot on the brake pedal is transferred to the wheel cylinder by the brake fluid. Once that pressure reaches the cylinder, it becomes hydraulic pressure that pushes the brake pad or shoe against its corresponding brake disc or drum. Then the vehicle slows down. But this effect will be lost if the brake fluid cannot resist the heat of the brake system. What a lot of people might not realize is there are multiple types of brake fluids available for a braking system. Each brake fluid type has its own unique rating because brakes generate heat from kinetic energy. You can tell the brake fluids apart by the designation they are given. This identifies the chemical mixture used to formulate the fluid. All brake fluids must abide by the standards of the U.S. Department of Transportation. The three most popular brake fluids are Dot 3, Dot 4, and Dot 5. The main difference between these fluids pertains to their boiling points. There are a dry boiling point and wet boiling point per brake fluid type. The glycol inside the brake fluid causes water to be attracted to it. This means that moisture builds up in the brake fluid, resulting in a wet boiling point. Therefore, the number rating of each boiling point is important to understand when reviewing the various brake fluid ratings. The most common brake fluid in the auto industry is the Dot 3. If you own a standard economy car, then it probably has Dot 3 fluid in its braking system. The Dot 3 is designed to handle some heat, but its boiling point is not as much as the boiling point of a Dot 4. But standard vehicles don’t need to handle as much heat, so their braking systems are made with Dot 3 brake fluid. The wet boiling point of Dot 3 brake fluid is 140°C and the dry boiling point of the same fluid is 205°C. Dot 4 brake fluid is preferred by many people because it can resist more heat in comparison to the weaker Dot 3 brake fluid. It is even formulated to be resistant to corrosion as well. The Dot 4 brake fluid’s ability to resist additional heat means that your braking system will be more reliable. For instance, if you tend to brake frequently as you drive in the city, then you will benefit more from Dot 4 brake fluid. In fact, any situation where you brake frequently will require Dot 4 fluid. Police vehicles and race cars even use Dot 4 because of its ability to resist heat so well. The wet boiling point of Dot 4 brake fluid is 155°C and the dry boiling point of the same fluid is 230°C. Based on these figures, you can see that the Dot 4 brake fluid has a slightly higher boiling point in comparison to the Dot 3’s boiling points. That is why Dot 4 is more heat resistant. Dot 5 brake fluid is not as common as the Dot 3 and Dot 4 braking fluids. You’d likely find Dot 5 to be used in the braking systems of military vehicles because of the extreme heat they often produce. This is because the boiling point of the Dot 5 is higher than it is in the other brake fluids. For instance, the wet boiling point of the Dot 5 is 356 while its dry boiling point is 500. This makes it far more compressible in nature. However, some Dot 4 brake fluids are made with high boiling points too. For this reason, everyday people would have no use for a Dot 5 because there are Dot 4 brake fluids which are made for extreme heat too. As far as the cost goes, the Dot 3 and Dot 4 are priced pretty much the same. So, why not purchase a Dot 4 then? Well, if you care about having federal regulatory approval on your brake fluid, then you will choose the Dot 3 because that is still considered the primary brake fluid, according to regulatory standards. That is why most car manufacturers install Dot 3 in the brake systems of their vehicles. However, as more vehicles are made with braking systems which produce greater amounts of heat, the need for Dot 4 might be the new requirement in the near future. As for Dot 5, don’t even bother worrying about it. Just stick with Dot 3 or Dot 4.